Positioned on the shoreline of Mersea Island, Essex, Anna and Simon had lived in their Victorian boathouse for three decades. They adored their coastal spot and the views from their garden overlooking the beach were the backdrop to many family celebrations and barbecues over the years. However, although the boathouse’s location and charm were undeniable, it failed to make the most of its natural surroundings and the layout of the property meant that the views of the landscape were lacking. After much deliberation Anna and Simon took the decision to embark upon something completely new, selling their boathouse and building a contemporary beach house in its grounds. Their three-bed beach house was designed to feel contemporary, open and relaxed with the principal goal of the property being to fully embrace its location and make the most of the natural views. 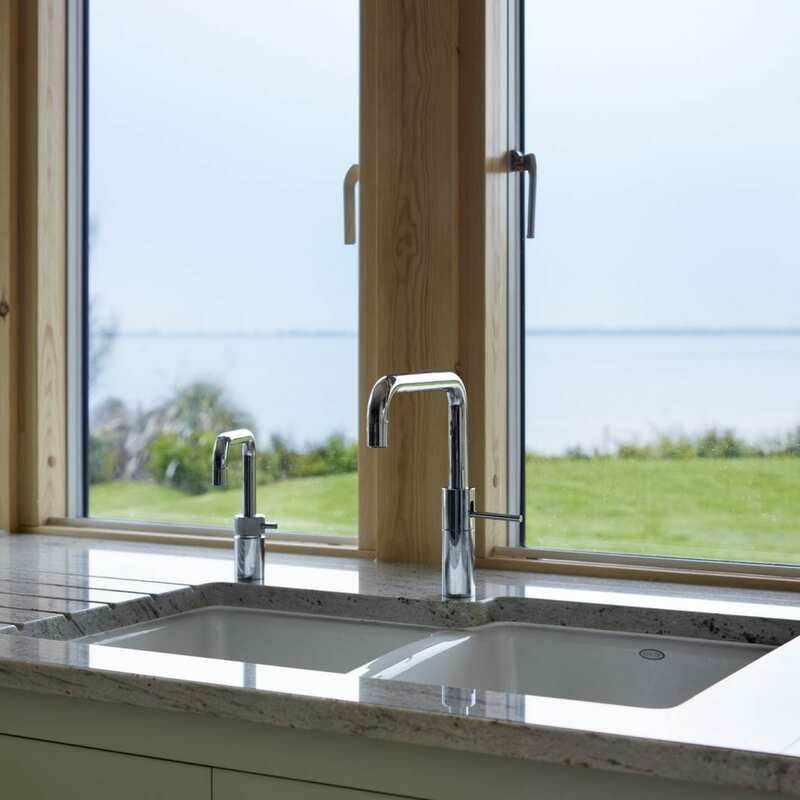 In-keeping with this Anna and Simon decided upon an open-plan layout, with windows and bi-fold doors lining the full length of the property which faces the water. 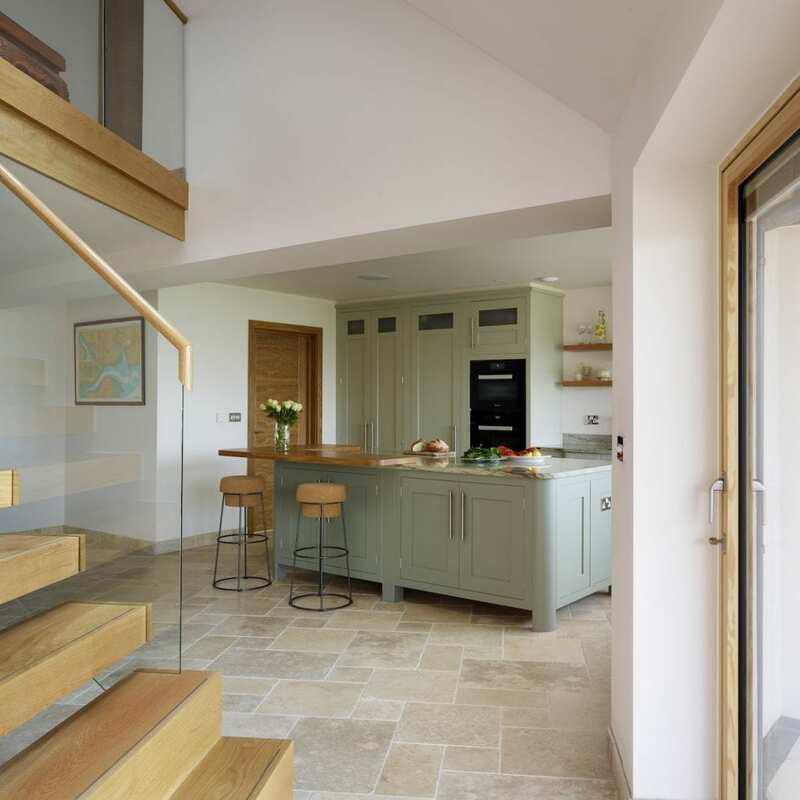 As a large part of the ground floor is the kitchen it was important that it reflected the design ethos of the building – contemporary, airy and organic. 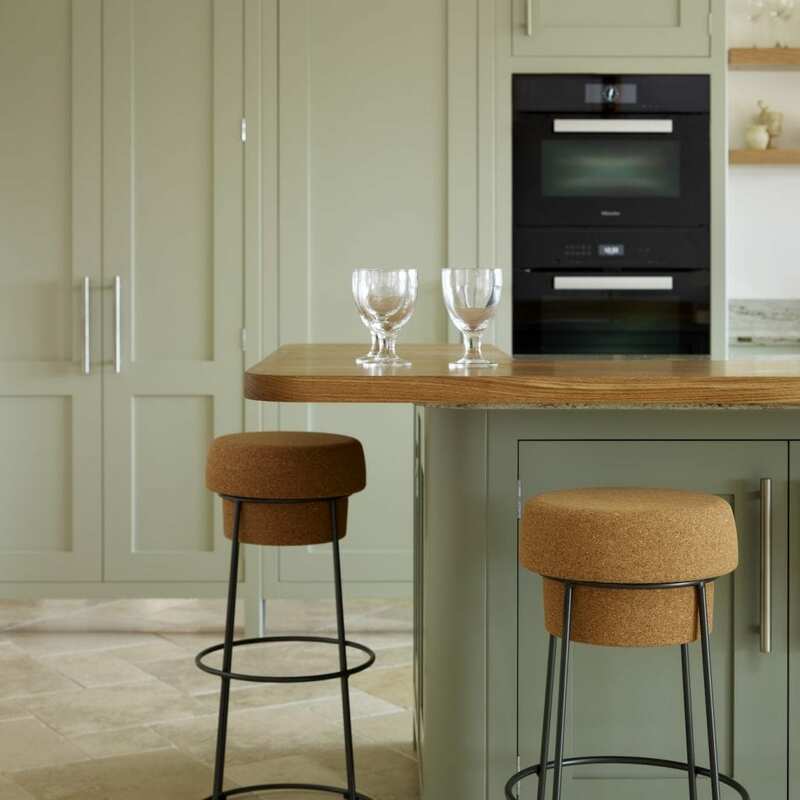 Anna and Simon wanted a simple shaker kitchen so they were drawn towards the uncomplicated aesthetic of our Mersea style, helped along by their own Mersea connections! 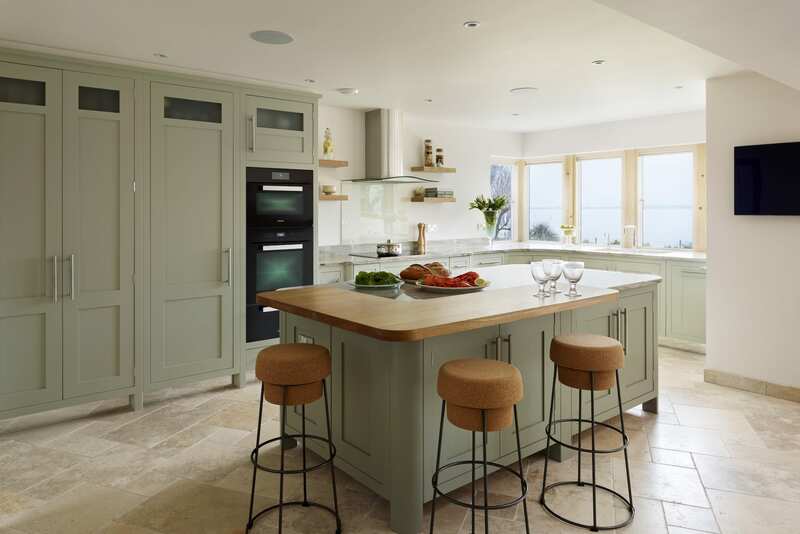 The layout of the kitchen was very important because Anna and Simon were particularly keen to ensure their new home would have an effortless flow. 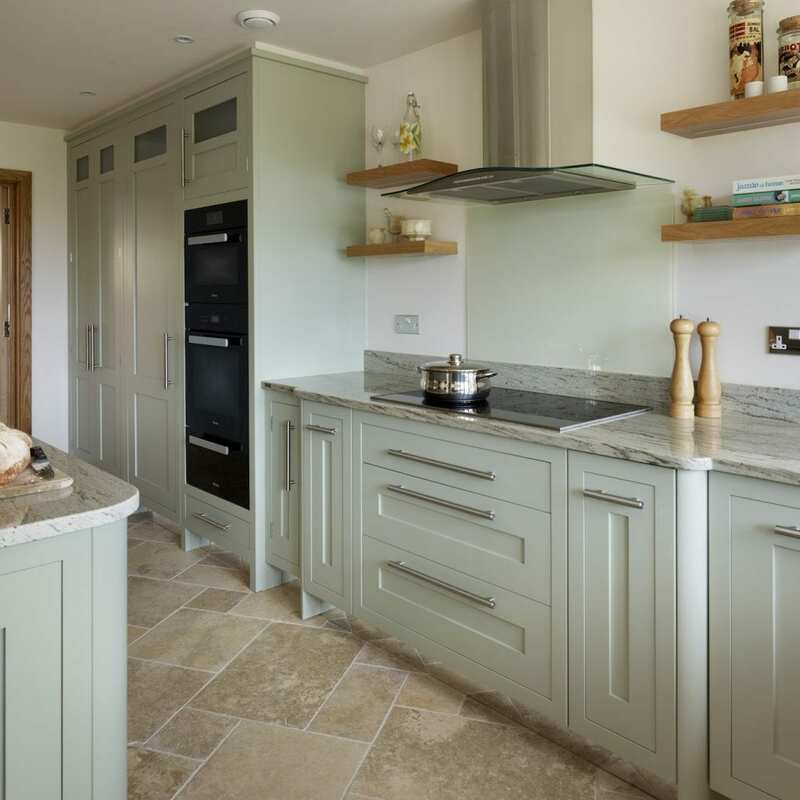 The cabinetry along the wall provides most of the storage for the kitchen as well the sink, ovens and hob. Part of the brief was to ensure the kitchen island wasn’t over-complicated. They wanted it to function as an informal seating space and also as the main food preparation area, but they were very clear that they did not want it to become the main cooking or clearing area. 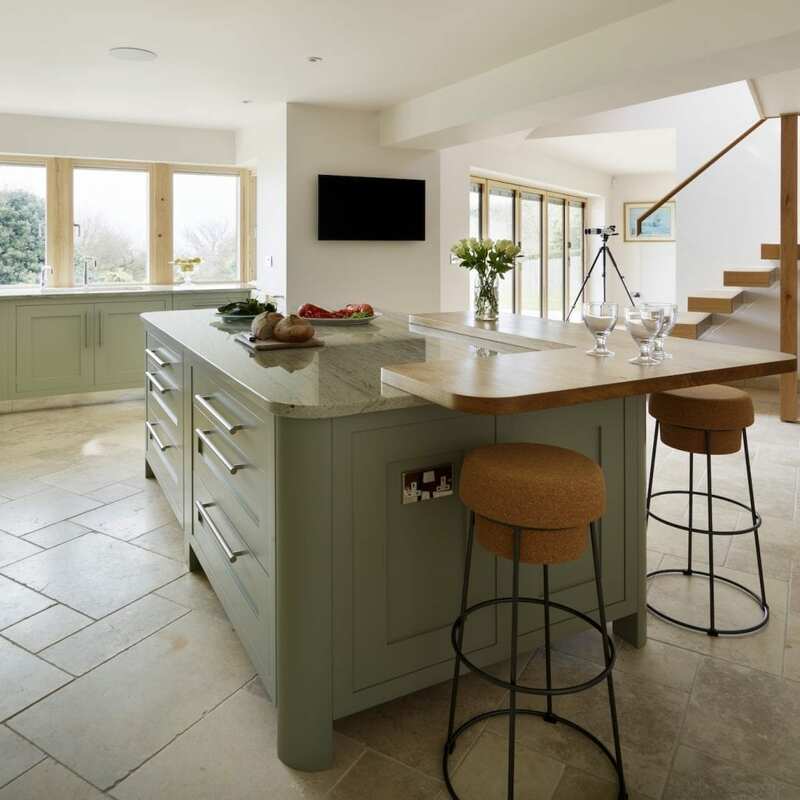 With this in mind the island was split into two distinct zones – the granite area acts as the main food prep zone with the wrap around oak breakfast bar creating a separate space to enjoy a drink or bite to eat. Aesthetically the room was designed to feel relaxed and with natural, rustic notes. 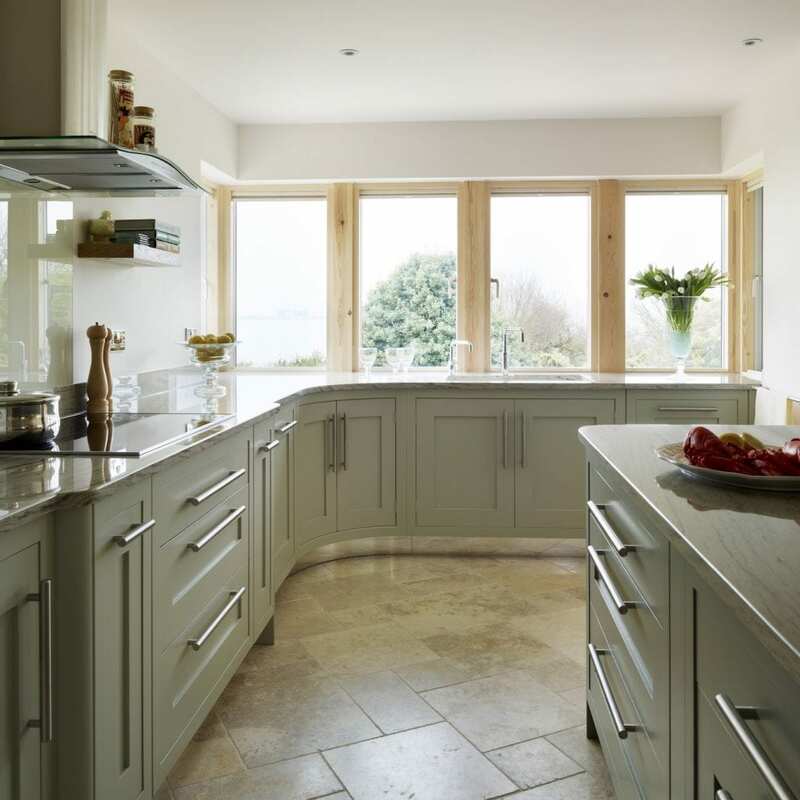 The worktops are river white granite which benefits from a beautiful light brown vein reminiscent of sand, perfect for such a coastal property. 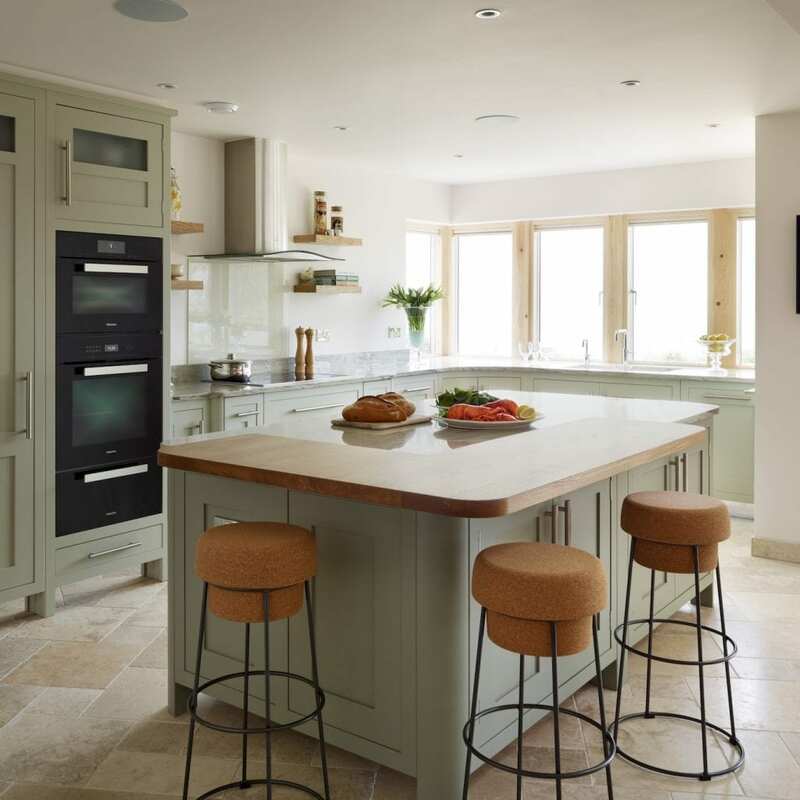 Soft green cabinetry, hand painted using Farrow & Ball – Pigeon, and oak features such as the breakfast bar and open shelves complete the look without complicating or adding any weight to the design.